On January 24th we are proud to host guest speakers: William Merwin and Leland Miyano as they share with us their vast combined knowledge about palms. Their talk will include information on Hawaii’s palms, palm growth habits and conservation efforts. 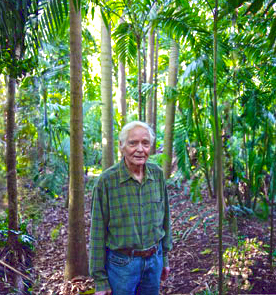 William Merwin, who has twice won the Pulitzer Prize for poetry and is the recent US Poet Laureate, has lived and gardened on Maui for over 30 years. Most of his focus has been on cultivating palms from around the world. He has gathered approximately 800 different species of palms, creating a truly unique palm jungle within the rainforest of Maui’s north shore. His enduring gardening passion along with his legacy of being a successful poet will be preserved with the recently created “The Merwin Conservancy“. Leland Miyano, a good friend of Merwin, is an artist, landscape designer and author from Oahu. Leland has years of experience working with native palms throughout Hawaii and has worked extensively with many highly respected people in the field of horticulture and design. Leland’s numerous books include: Hawaii’s Beautiful Tree’s and Hawaii, A Floral Paradise. Leland’s own 1-acre garden in Kahalu’u is renown for its design and features numerous palms.